These days it really is hard to know who to trust when you're eating food, from the provenance of the ingredients to the ethics of the manufacturer, especially when you live in a city which thrives on fad foods, body perfection and the next great diet. 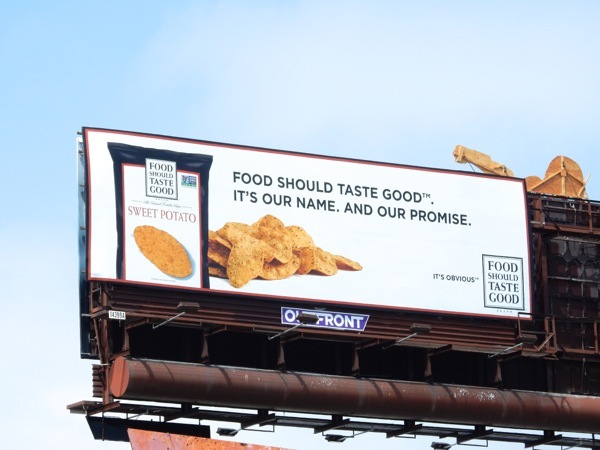 That's why even though their brand name may be more than a mouthful, Food Should Taste Good clearly communicates the philosophy behind this line of snack products in their billboards. 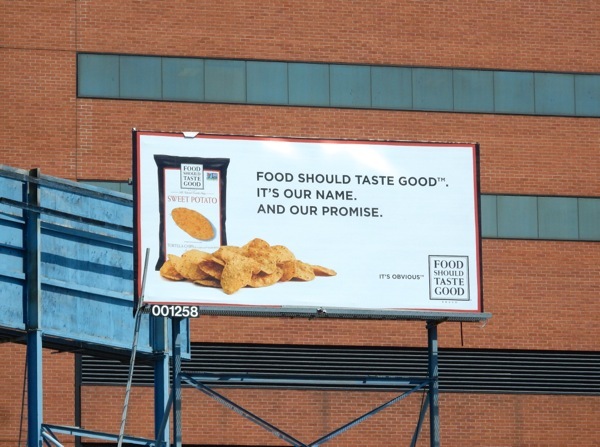 If you've got the munchies this weekend, maybe these bags of chips will satisfy your cravings and hopefully be a treat that lives up to their taste credentials. 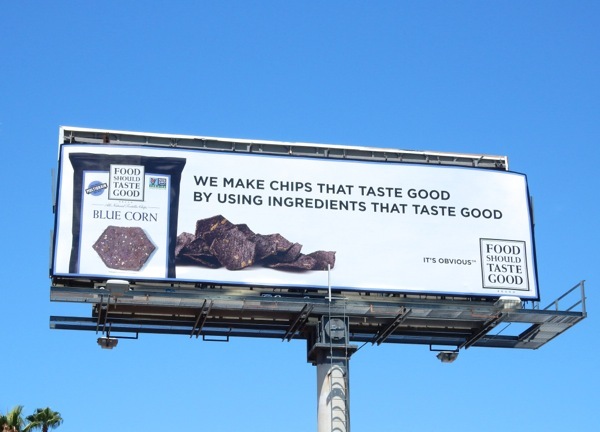 Made with real ingredients, zero trans fat and containing no cholesterol, these chips are also certified gluten free and Kosher (although no one is advocating you should eat them for breakfast, lunch and dinner). 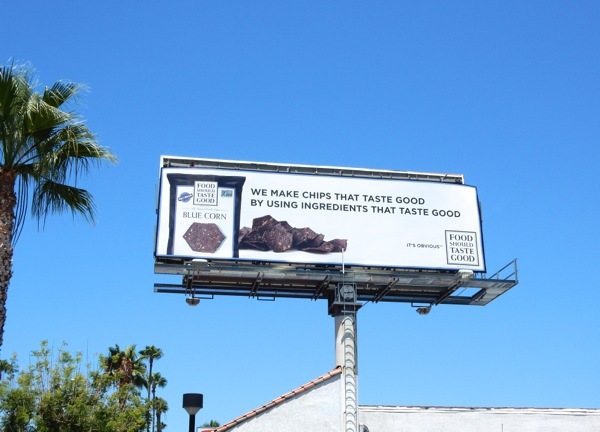 The 'Blue Corn chips' ad creative was spotted along Ventura Boulevard in Studio City on July 3 and the 'Sweet Potato' versions were spied above Santa Monica Boulevard just before Westwood Boulevard the next day and later that month on July 24, 2015 along San Vicente Boulevard. 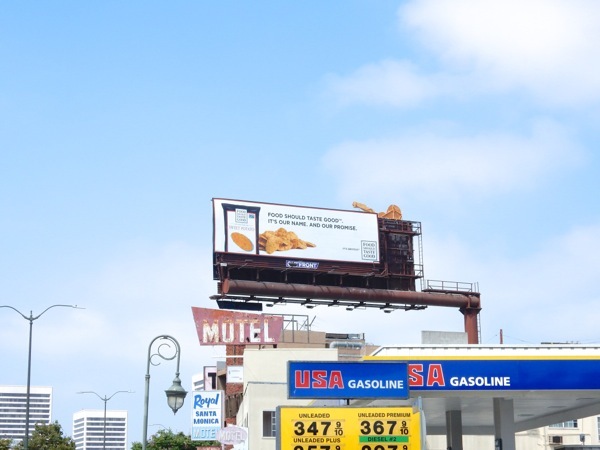 For more snack billboards, be sure to check out this Popchips outdoor ad campaign from Summer 2012, these Butterfinger billboards featuring The Simpsons and these Oreo Wonderfilled billboard ads. Remember, an apple a day keeps the doctor away, but a bowl of chips in front of the TV is much more fun. 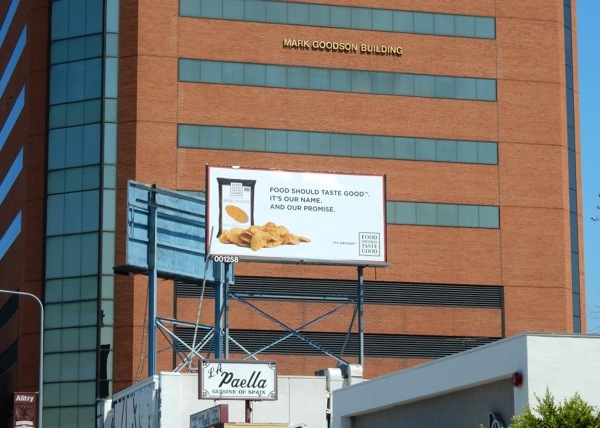 For some strange reason all this talk of snack food has made us hungry. Munch, munch.